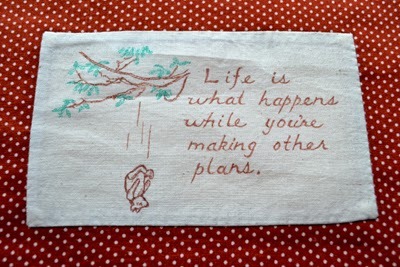 "Life is what happens while you are making other plans". I don't know who originally penned these words, but they are certainly true! "Need is also the mother of invention" and what sparks problem-solving that can be exceed creativity beyond my artwork, though to be sure my creative work goes hand-in-hand with life challenges. This quilt block will soon be added to my Comfort-Her. Living itself is an art and hopefully by the time I reach the end of my life, I hope that it will be said that although my life isn't perfect, I faced it head-on with faith and lived it to the fullest? I know that God has promised that he will never give us more than what we can handle but sometimes I want to call His Complaint Department and let Him know that He has likely confused me with another far stronger. Perhaps I got someone else's share of aggravation this month in addition to my own? Then I pause and reflect and remember that some people live in huts that don't keep out the rain, have little to eat and are perfectly content that they are so blessed and I feel guilty for being such a wimp! About one and a half years ago I wrote that my husband had been suddenly laid off his twenty-two year position in the executive office of a well-known, established international retail store. It has been a life-changing event, and one that keeps on giving us challenges, especially with my husband being so close to retirement age! Our location isn't helping, when it comes to employment opportunities. Jobs that seem to be most readily available have been the sort that don't pay, are seasonal, or part-time without adequate salaries or benefits. I know that he is not alone in having to piece together multiple jobs to replace what he had before. 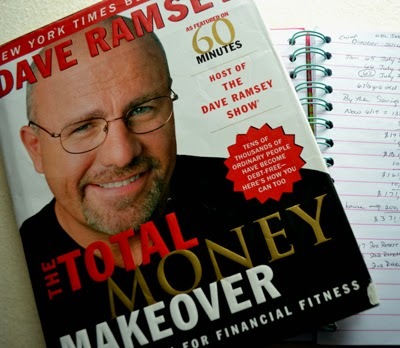 Maintaining confidence during this struggling economy is added to the list of challenges that face him as well as others. Despite my inability to work outside of our home right now, and my husband's various jobs, we have managed through a year and a half of diminished income and are inching toward full retirement benefits, with no intent to fully retire. Should everyone be as fortunate as us! Perhaps we are at last sharing just a sliver of the hardship of the world that is so unevenly distributed! Though I dream of a life with a little less stress in the future, with much creative problem solving, brainstorming, information gathering, manipulating figures and stitching-away my worries, we will "make it"! Perhaps this will be my testimonial for my Great Feet for Great Feats Fleece Socks, proving yet another great feat performed while wearing them? Instead of a pity party I think I will host a "Pollyanna Party" and all who come will need to be truly "glad" about something. 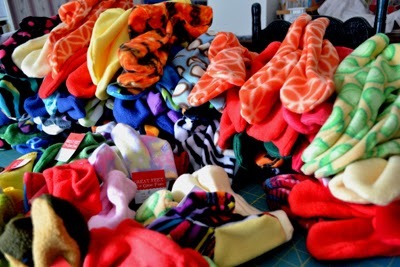 I will be glad to have my year's supply of fleece socks all sewn , tagged and ready for my holiday craft shows, as well as some rather brilliant, (if I do say so myself), financial planning ready to set in motion. It continues to amaze me that God seems to give us what we need, as we need it...thanks be to God!